Argentina lays claim not just to the Falkland islands but to any resources found there. 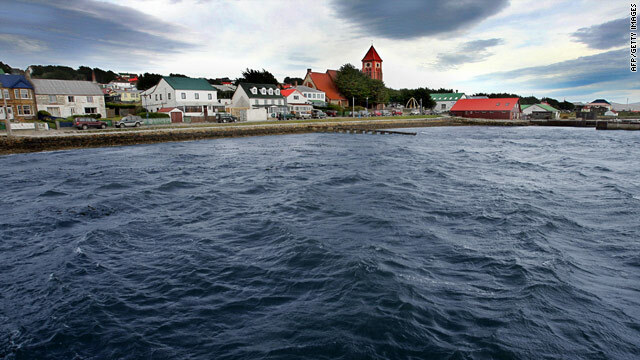 Desire: "Oil may be present in thin intervals but reservoir quality is poor"
(CNN) -- The value of shares in a British company drilling for oil off the Falkand islands halved Monday, after it revealed the existing supply may not be commercially viable. In a statement on its Web site, Desire Petroleum said "oil may be present in thin intervals but that reservoir quality is poor." Desire will release the final results of its 30-day test drilling operation in the South Atlantic archipelago on Wednesday. According to the company it may have to drill deeper to find greater quantities of oil and gas. Desire estimated that the North Falkland Basin could contain 3.5 billion barrels of oil as well as having "significant gas potential." But potential revenues from oil and gas reignited a long-running dispute between London and Buenos Aires over ownership of the Falklands. Last month, Argentine President Cristina Fernandez de Kirchner signed a decree requiring all ships navigating from Argentina to the islands to carry a government permit. The Falklands, known as Las Malvinas in Argentina, lie in the South Atlantic Ocean off the Argentinean coast and have been under British rule since 1833. Argentina has always claimed sovereignty over the islands and invaded them in 1982, prompting a war in which more than 600 Argentinean and 255 British military personnel died. The island's government, representing a population of around 2,500, remains committed to British sovereignty and the UK maintains a military presence on the islands. The Argentine position is that natural resources around the islands should be protected, and Britain must accept international resolutions labeling the Falklands a disputed area. "This has to do with the defense of the interests of Argentineans, not just about sovereignty," Argentine Cabinet Chief Anibal Fernandez said in February, adding that Argentina lays claim not just to the islands, but to any resources that could be found there.